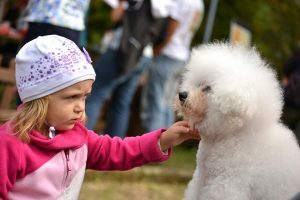 Knowing how to train a puppy is important for new Bichon Frise owners, if you want your new puppy to grow into a well-behaved pleasant dog that people enjoy being around. 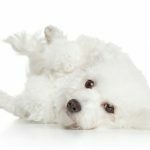 While it would be nice if all Bichon Frises had perfect behavior right from the start, the reality is that you will need to work with your new puppy to teach her how to behave. 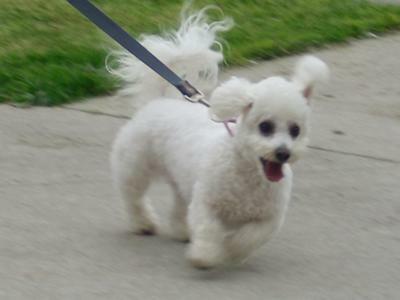 While it is true that Bichon Frises are very happy, cheerful little dogs, they can also be willful or manipulative. And they are notorious for being hard to potty train. Leash training is one of the challenges of working with a Bichon Frise puppy. 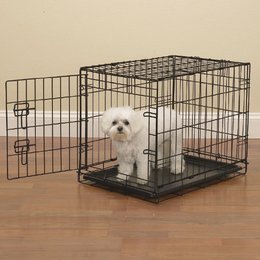 In fact, Bichons are among the top 10 dogs that are the most difficult to house train! They are sensitive and very willing to please, so training a Bichon should never be done with force or undue strictness. Bichon Frises respond to gentle firmness. Doggie Dan with a young puppy. Dan’s training videos work well with Bichon Frise puppies. 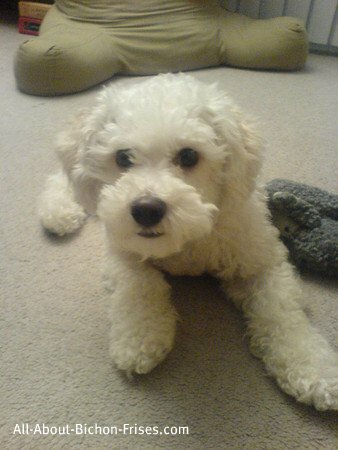 If not trained properly, a Bichon Frise can end up being the Alpha dog (or dog in charge) of your household. That should be YOUR place! 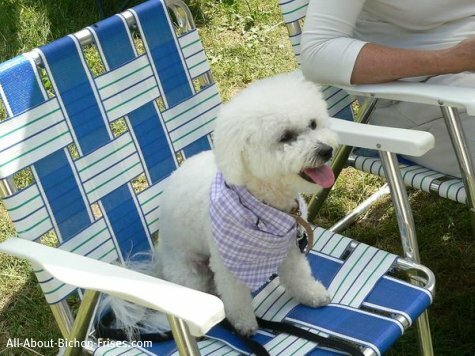 Training your Bichon correctly, will show your Bichon that YOU are in charge! 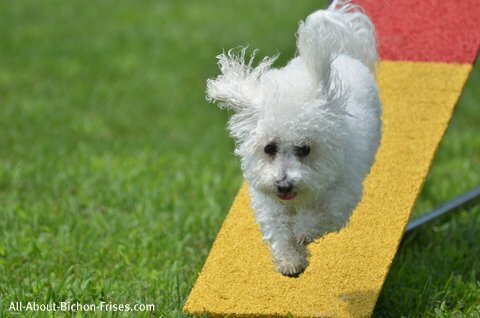 While training your new Bichon Frise puppy may seem daunting at first, it can be done easily if you know how. You will need to have short (5-10 minutes) but regular training sessions with your puppy. 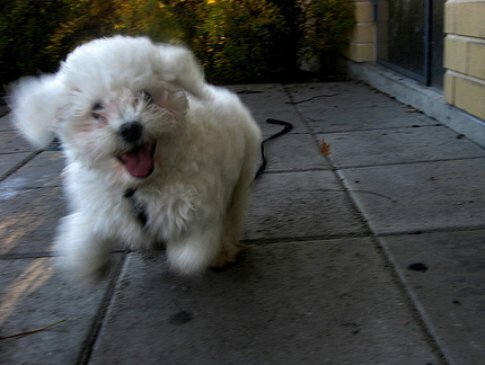 Train your Bichon Frise puppy early, so she does not get out of control. 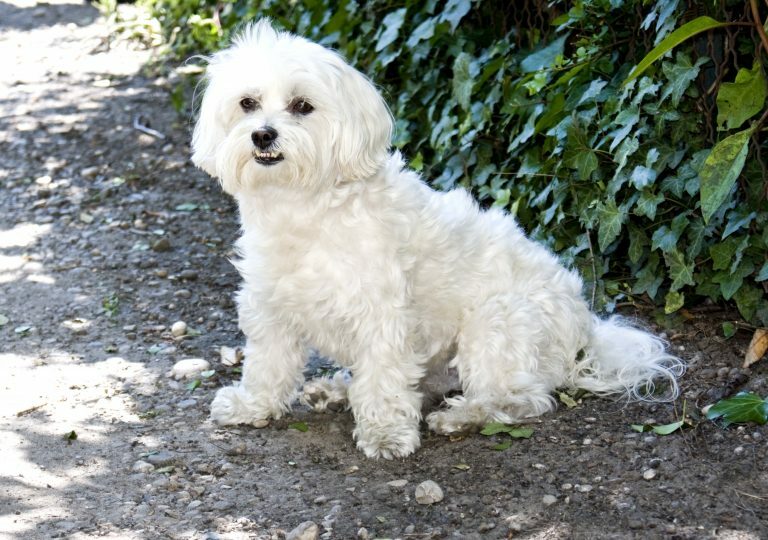 An untrained Bichon will soon take charge of your home! Start working with your puppy right away. Even if you think you don’t know how to train a puppy, you will learn how to do it, and puppies are very forgiving. Most importantly, you need to be consistent in your training, patient with your puppy or dog and you need to use effective training methods (shown in the Doggy Dan videos). You can view the videos for just $1 for 3 full days. Just click on the link above to get started. 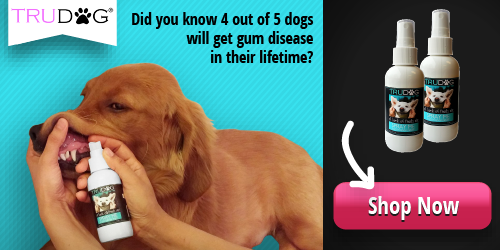 I would not be exaggerating to say that I have researched and examined dozens of dog training programs. Most programs have some good points and tips to help with training. If you train your puppy well, she will be gentle and well-behaved, even with small children. 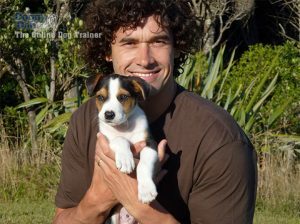 However, I must admit that I was bowled over when I found the Doggy Dan training program. Doggy Dan has a gentle manner and obviously loves dogs, and they love him in return. But, far more important, his simple-to-use system really works! 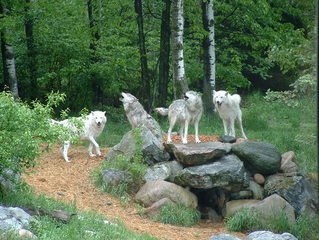 Take charge and be the pack leader – Dan gives you 5 easy steps to follow. Just taking these easy steps soon puts you in charge. This first tip will work miracles with even the most stubborn Bichon Frise. Teach your dog to come – Dan will show you how to do this, using a long lead. When your puppy obeys this command, it should always be a positive experience. Never call your puppy to come, to discipline him. Stay calm. – You need to stay calm and your dog will sense your mood. When you become frustrated or anxious, your puppy feels anxious and upset, as well. Socialize your puppy early – Your dog needs to become comfortable with both people and other dogs. Teach in steps – Puppies learn quickly and they are eager students. But, if your puppy is having trouble learning a new command or trick, break it down into steps. You will soon have success.